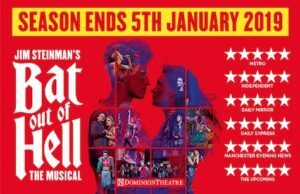 Bat out of Hell – the Musical is based around the idea of a dystopian society where groups of people stop aging at 18, and is reminiscent of the Peter Pan storyline. I hadn’t realized that composer Jim Steinman had that in mind originally, and this is a twist on his ideas. Set in the future, the Peter Pan/Rock n Roll love story bursts onto the stage, though the pretty magical setting of Neverland has been swapped for a black and grey sewage system (it seems). Once you ditch making sense of the storyline (not that important really) and start listening to the songs, the show just comes alive. I have to say Zahara (played by Danielle Steers) stole the show for me. Danielle just shone; she was funny and powerful and her voice was incredible. ** Snippets from the toilets – “I loved the lady with the hair, you know and the leg – she was incredible”. I overheard this after the show in the ladies, and completely agree. Danielle played a blinder. To be fair, all of the leads were strong, with Andrew Polec (Strat) and Sharon Sexton (Sloane) particularly impressing me with their vocals and stage presence. So, the set is a really mixed bag. I was not really that wowed by it generally. The motorbikes are pretty but not that convincing, moving a little sluggishly as they are set on tracks. There are, however, moments of genius like the car crash (I won’t elaborate as it might spoil the surprise), the plunge pool, and the fireworks all of which worked well. One scene reminded me of the “The Handmade’s Tale” it was so grim, with hooded bodies hanging from the ceiling – not sure that added to the show, honestly. I was also a bit disappointed with the seating as we definitely had a restricted view at times being over to the right in the stalls. Not sure the hand held camera worked brilliantly (though done extremely well – all credit to the cameraperson) as I couldn’t see the right side of the stage where the action was happening and always felt I was just missing something. BOOH holds a special place in my heart, from those teenage years when, to survive a party with my head held high, I had to learn the lyrics to every song on the album. And I did. And I’m glad that I did as I really appreciated the performances of those songs in this show. Despite the over-ambitious set, I loved the show and the energy that radiated around the theatre. Old friends like Two out of Three, Dead Ringer for love, Heaven Can Wait, Paradise by the Dashboard light, and Crying out Loud washed over us, reminding us just how well they stood the test of time. I’d go and see it again, and be a bit braver next time about singing along loudly from the start.